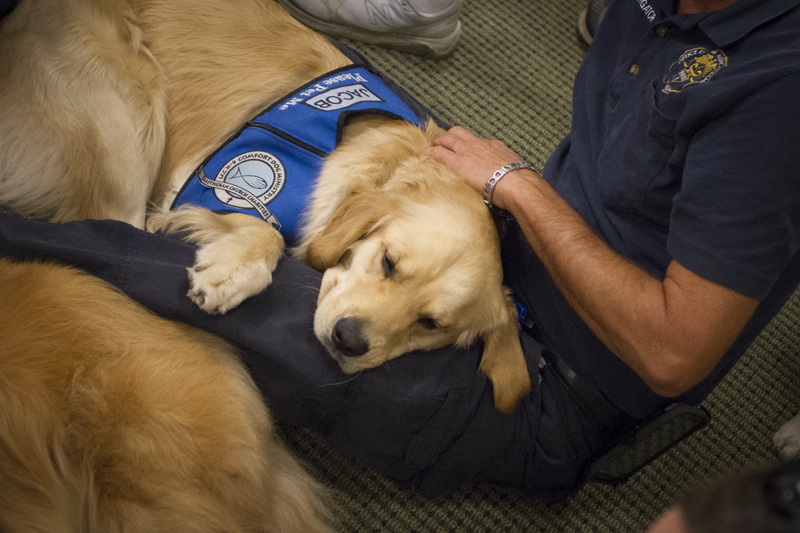 In the wake of tragedy, Lutheran Church Charities’ K-9 Comfort Dogs deployed to Orange County, Fla., to help soothe the pain of those impacted by the Pulse Orlando nightclub shooting. Golden Retrievers from all over the U.S. traveled to Orlando to comfort survivors in the hospital, families of the victims, Pulse employees, first responders and members of the community. Among those who received a visit from these furry friends were employees at the Orange County District Nine Medical Examiner’s Office and the Orange County Government Administration Center. The Orange County Medical Examiner’s Office worked around the clock to identify, autopsy and reunite the 49 victims of the Pulse tragedy with their families. The comfort dogs, whose vests read “Please Pet Me,” complete a one-year training program, starting when the pups are just eight weeks old. They have traveled to Newtown, Conn., following the Sandy Hook shooting and to Boston after the Boston Marathon bombings to offer comfort and warm snuggles during a time of grieving. During the dogs’ visit to the Medical Examiner’s Office, ABC News documented the love and hugs the golden retrievers brought to the staff. Watch ABC’s video. As for Dr. Stephany, he says it’s important to have a way to decompress after work each evening, which is why he has two golden retrievers of his own; Kennedy and Gronkie. To view photos from the K-9 Comfort Dogs’ visit to the Medical Examiner’s Office, visit Mayor Jacob’s Flickr album.